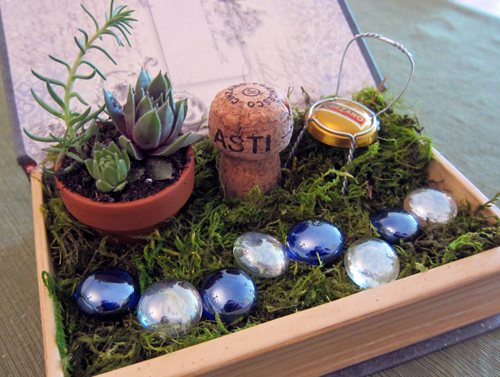 Miniature or fairy gardens are super popular in the Midwest right now. I decided to make a desktop fairy garden for my work office. Sadly, I’m a black thumb–that’s someone who kills everything they touch despite all of their best efforts to keep flora and fauna alive! But, I do have a few plants flourishing right now on the front porch because I have made a point of letting nature take its course and leaving them largely alone. So I wanted to make something to spruce up the office at work (as opposed to the office at home). I work for a small publishing company and my office is a cube with no direct light. So I hung some fabric and framed a cute art card but it still needs something else. 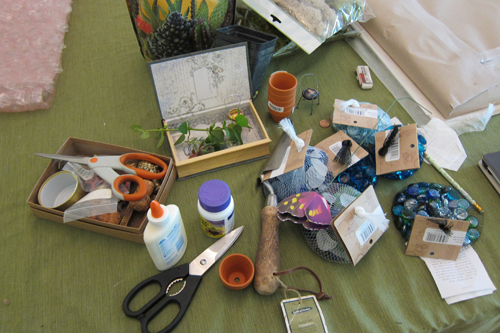 My bevy of supplies–I used very few of them, actually. Less is more (or so I’m trying to tell myself). 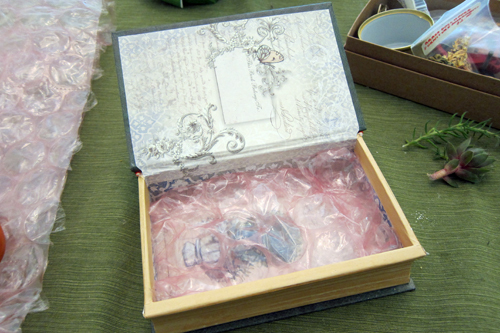 First the prep work: I put large bubble wrap in the bottom of a mini decorative box. I put some glue on the bubble wrap (pretty pointlessly, I’d bet) and then took some dried moss and spread it out over the bubble wrap: Wheee! It looked pretty cool. Better than I expected, to be honest. 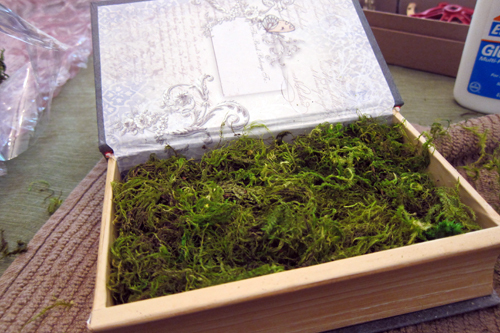 I’d never even touched dried moss before. 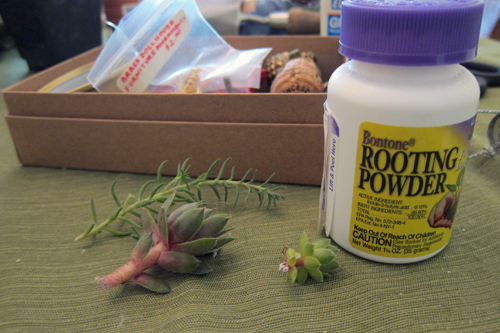 I dabbed some rooting powder onto my clippings. I have no faith they will do anything but die so I didn’t sweat it too much. I’d say this is an optional step. 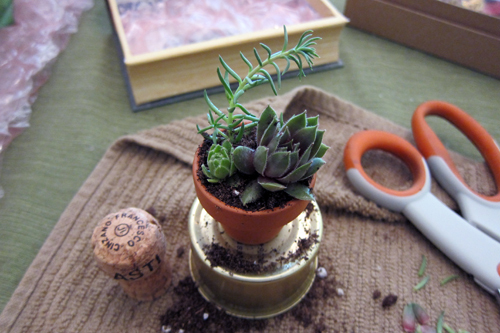 I got a few one-inch pots at Michael’s and put one to use here. I filled it with soil and then placed my clippings in. It looked pretty great, which came as a total surprise to me. 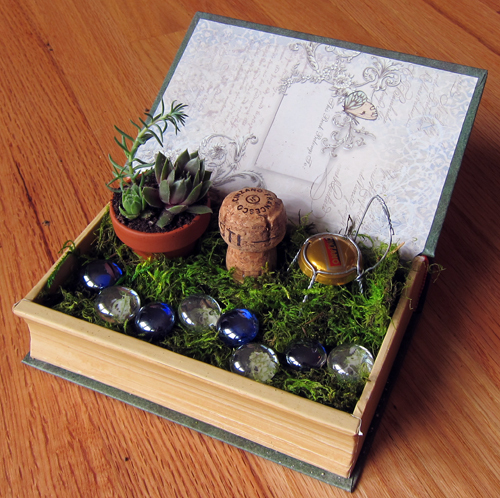 So I had my little decorative box and a champagne chair I’d made previously as well as the cork from the same bottle of Cinzano. 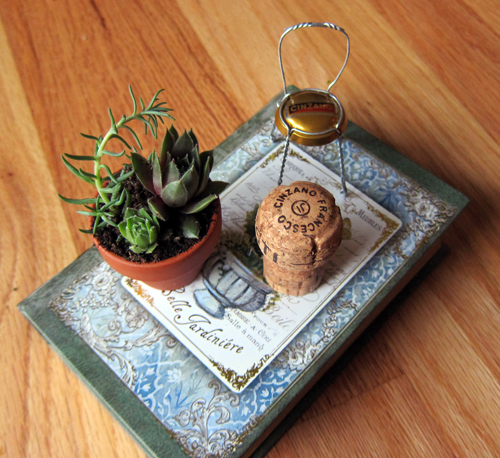 Making a chair out of a champagne cap is crazy easy and instructions are widely available. I think Design Sponge has a quick and easy one if you want to make your own. I opted to use the cork as a little table for the chair. And here is how I put it together. There’s a lovely real plant, a little fairy chair and a little fairy table. In addition, I put glass pebbles along the edge in a haphazard pattern to form a little pathway. I also glued the pebbles (which, in retrospect seems fairly pointless). Sadly, immediately after the fairy arrived, my cat Bela came up and ate it. Better luck next time, fairy! Kidding! Though Bela loves to eat bugs. 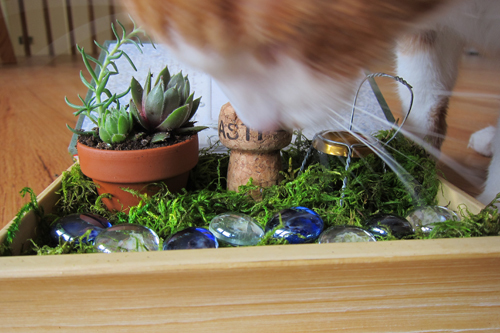 Anyway, it was a quick and easy project that will be very charming on my desk at work. Oh, how I wish we lived closer together. Maggie is obsessed with fairies right now. She would love this. You know I am too lazy to try it on my own!